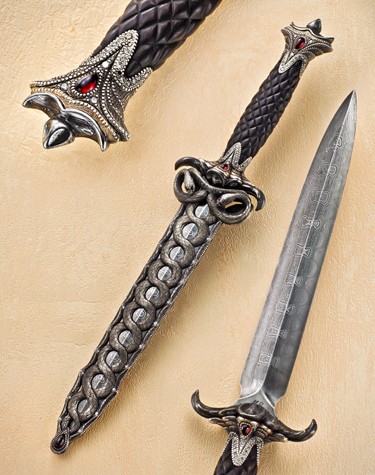 Our latest offering the "Serpent Dagger", truly evokes the mystique of the serpent. It is a symbolic beast in every culture's mythology. Again Joseph explores the use of repeated motifs, rich textures and patinas. The hilt is constructed with several modular sections of silver, African Blackwood and Damascus, all extensively worked to perfection. The sparkle of strategically placed diamonds and garnets draw attention to the finely carved surfaces, lending the entire piece an air of royal richness. The finely wrought Damascus steel blade exhibits a depth of chatoyancy that is truly "holographic". One can stare into it's depths for hours. Each time the blade changes position, the light reveals new and intriguing visual wonders. The hand wrought silver scabbard fits flawlessly to the blade. The serpent motif is a commanding presence, taking the viewer to an age long past. The beaded edges, diamond accents and fine leaf engraving just put the whole thing right over the top! Taken altogether, it's one outstanding package! Measures: Blade: 7.5" Handle: 5.5" Total Length: 13"